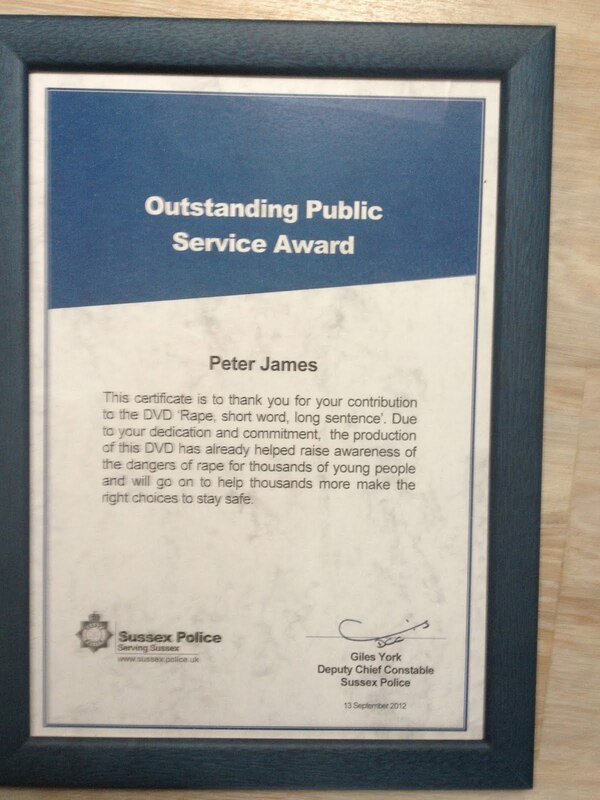 unexpectedly, Giles Yorke, Deputy Chief Constable of Sussex Police, presented me with the Sussex Police Outstanding Public Service Award. I had terrific help from the Film School of Brighton College, and two film students, Ollie Pothecary and Dave Thomas co-produced with me and directed the film. We had wonderful young actors from the West Sussex Youth Theatre, and JLS extremely kindly allowed us to use one of their tracks. The film has been rolled out to schools in Sussex, Surrey and Kent and the reaction we are getting from the kids watching it is fantastic, so I am thrilled. And as for that award – wow! Of all the awards I’ve been fortunate to receive, this one has a very special place in my heart.